Property 9: Cozy, garden solarium, sea amazing views, air cond., washer- Lucca Pisa. Property 12: Stunning traditional Tuscan country house in Versilia with sea views. Property 14: Tuscany Viareggio seaside. Discover Tuscany! 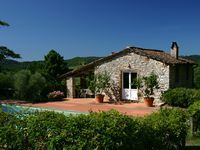 Property 15: Lovely detached house with private swimming pool, near Lucca. Property 18: Your cottage with private pool! Property 19: Beautiful vacation house with a 250 m) garden. Property 35: Nice holiday apartment with large garden, not far from the sea. Property 39: Cosy village house with a nice terrace offering beautiful views of the valley. Mary-Luise, I was lucky enough to be one of the guests staying at Villa Serena recently. What a beautiful home! An absolutely stunning setting and indeed very serene. Early mornings in the garden watching the world wake up - Long afternoons by the pool watching the sun begin to set - Dinner time outside under the grape trellis - ALL overlooking the sea were delightful. Your home is beautifully appointed with many details that are often missing from home rentals, extensive kitchen equipment, artwork, china, linens, and candles. And the large stack of beautiful tea towels, so wonderful! We set a beautiful table every night to go with our meals. We truly loved to cook in the outdoor pizza oven which was generously stocked with nice dry wood making it easy to start the fire within. What a treat! The house keeper was there to greet us and went through every aspect of the house upon our arrival, pointing out all the amenities, even down at the pool house. There are also information manuals for everything in the house and details about the area in general. She also was so helpful when on one occasion part of our group was locked out and she showed up quickly to let us in. We look forward to our next visit. Great house, great location, great holiday!